Join the premiere acrobatics team on the East Coast! Acrobats, cheerleaders, gymnasts, class members – you are invited to tryout for the Emilia’s acrobatics team! 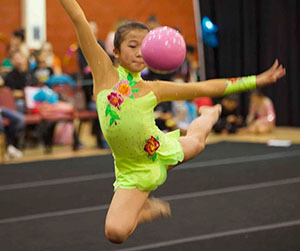 Home to the most National Team members in the area, Emilia's Acrobatics is a great place to train! All levels of experience are welcome - at least some basic gymnastics or acrobatics experience is necessary. An acrobatics pre-team is available for those who need to gain experience. Payment is not required, but we ask that you register below so we can get some information and set a time to evaluate the athlete. Each athlete must also bring a signed waiver form (see the link below). Waiver forms are also available at the front desk. You've always wondered what it was about, now try it out! We're proud to partner with All Star Rhythmic to offer a rhythmic program at Emilias.